Model for species specificity in modes of CMV TRS1 action. (a) Mixed phase/fluorescence photomicrograph of a CMV-eGFP plaque infecting a monolayer of cultured human fibroblasts. CMV infections are usually asymptomatic in the approx. 50 percent of adults who are seropositive for CMV in the United States, yet CMV can cause life-threatening infections in newborns, transplant recipients and HIV-infected persons with advanced immunosuppression. (b) Divergent modes of HCMV and RhCMV antagonism of PKR. In the tactic used by HCMV to thwart the PKR pathway, TRS1 binds to dsRNA and dimerizes with PKR before it becomes activated. In contrast, RhCMV TRS1 binds to African green monkey PKR only after PKR has undergone auto-phosphorylation. Both tactics block the eIF2 kinase reaction, permitting continued viral replication. Viruses often exert powerful selection pressures on their hosts, causing rapid evolution of host genes with antiviral activities. In turn, viral antagonists of these genes quickly counter-evolve, driving a molecular arms race between host and pathogen. 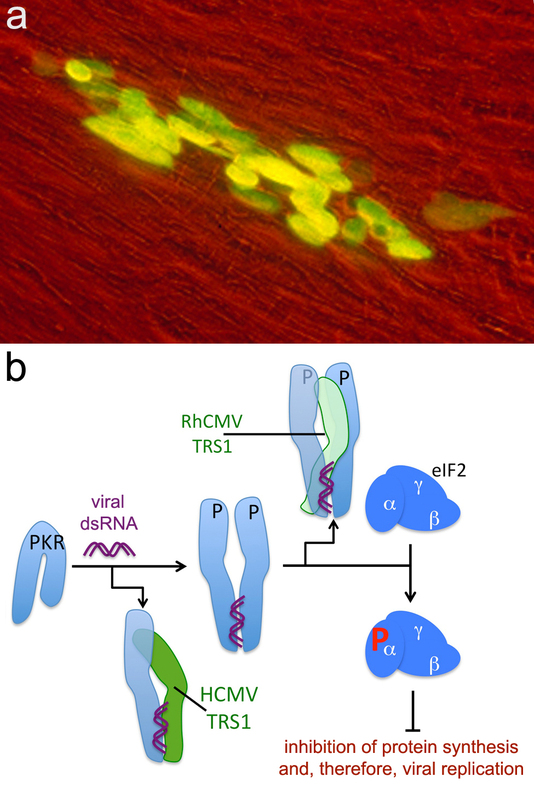 A general antiviral strategy deployed by vertebrates involves protein kinase R (PKR). In the presence of double stranded viral RNA (dsRNA), PKR phosphorylates the translation initiation factor eIF2α, which inhibits protein synthesis and blocks virus production (see fig.). As a result of several viral strategies to evade PKR function, including PKR mimics and dsRNA decoys, PKR has been subjected to some of the most intense bouts of natural selection documented in primates (Elde et al., 2009). Like other viruses, cytomegaloviruses (CMVs) have had to cope with multiple host defenses, including the PKR pathway. CMVs have evolved PKR antagonists, such as the dsRNA binding protein TRS1. Evidence of strong selection on primate PKR motivated principal investigator Dr. Adam Geballe (Human Biology Division), staff scientist Dr. Stephanie Child and two other members of the Geballe Lab to investigate the contributions of CMV TRS1 to PKR evolution and, conversely, the effects of PKR divergence on the actions of different TRS1 proteins. Child et al. engineered vaccinia virus to manipulate the expression of TRS1 orthologs during infection of cultured primate cells. The authors found that human TRS1 (HuTRS1) inhibits PKR activation in human cells, but permits it when expressed in cells of Old World monkeys (rhesus and African green monkeys). In contrast, the rhesus monkey CMV homolog of HuTRS1 (RhTRS1) blocks the PKR pathway in the cells of African green monkeys, yet fails to do so when expressed in human or rhesus monkey cells. Despite this species specificity, Child et al. also demonstrated that both HuTRS1 and RhTRS1 bind to dsRNA. In primate species in which they are effective, both TRS1 proteins also bind to PKR. The authors were initially puzzled when they found that RhTRS1 rescued vaccinia virus replication in African green monkey (AGM) fibroblasts but was unable to bind to kinase-dead AGM PKR in the yeast two-hybrid assay, which they used to study patterns of protein binding. This suggested that RhTRS1 and HuTRS1 might block the PKR pathway via different mechanisms. Digging deeper into this hunch, the researchers went on to conclusively show that HuTRS1 binds to inactive human PKR, whereas RhTRS1 binds to AGM PKR after it has been phosphorylated (see fig.). These findings reveal yet another important influence on the multifaceted arms race in which PKR is embroiled. Counter-evolution of this critical host defense protein has diversified its binding interface, fundamentally altering mechanisms of PKR antagonism by the TRS1 proteins that are encoded by different CMV lineages. Child SJ, Brennan G, Braggin JE, Geballe AP. 2012. Species specificity of protein kinase R antagonism by cytomegalovirus TRS1 genes. J. Virol., published online ahead of print, 25 January 2012, doi:10.1128/JVI.06158-11. Also see: Elde NC, Child SJ, Geballe AP, Malik HS. 2009. Protein kinase R reveals an evolutionary model for defeating viral mimicry. Nature 457:485-490.